The workshop started late the first day (good old belly dance time) and when things did get started, the teaching never stopped. Information continually rolls from Morocco’s lips. We started with some very basic warmups. No “killers” but lots of repetitions of stretches that left us warm and ready to go. Comparative 6/8s were first. 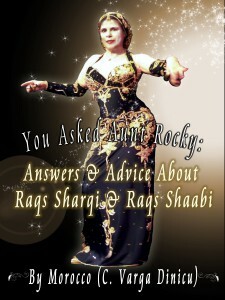 She explainbed the difference between Persian, Iraqi and Moroccan 6/8 dance movements, how they were determined by women’s place in society and the clothing they wore, especially in Persia where styles have been influenced through the centuries by both the West and the Far East. Persian dance could move from side to side or back but never forward (too bold) and no forward twisting hip movements that might mess up a beautiful and tight-fitting garment. Iraqi women had a bit more freedom with looser clothing and could move forward slightly as long as they retreated immediately, showing a playful side. Moroccan 6/8 dance moves were much more on the “let it all hang out” side, reflecting the loose garments and higher status of women in North African societies. We were taught a lovely little Persian routine to a tune from Jalaleddin’s first album entitled “Vara Tageree”. Morocco said that although many believe this music to be Greek, it is Persian in origin. 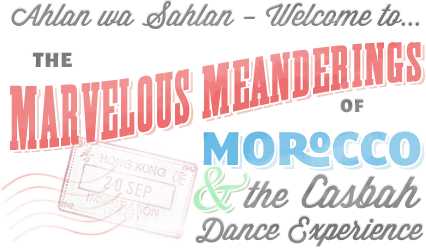 The dance was simple, repetetive and had beautiful arm styling (classical ballet arms were influenced by Persian dance). After a lunch break we were treated to movies of dancers Morocco had taken during her numerous trips to Egypt. The movies ended just about the same time the workshop was to have ended but we continued on with our Persian dance for a while in order to take notes and clarify steps. The next day started out with the same group of warmups. 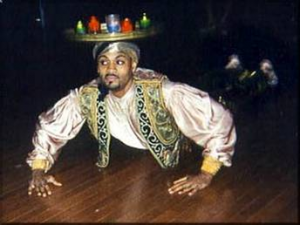 Morocco broke down a “Maya”, concentrating on the straightening and bending of the knees to get the hips to move correctly. She also broke down a “3/4 shimmy” in a marvelously simple way. Instead of using, for example, a R,L,R, hip tilt with a hold on count 4, she used a simple double “bump”, RR, LL stepping same foot as moving hip. The Guedra ritual of Morocco was examined next. She explained that the name “Guedra”, which is applied both to the “Blue Woman” (sic) doing it and their dance of blessing and thanksgiving, actually is the word for the cooking pot that doubles as a drum for this pulsing, trance-like dance that ends on the knees. We had great fun following Morocco around the room doing Schikhatt dance steps. Morocco explained the role of the Schikhatt public dancers in Moroccan society as the “teachers” of the facts of life for young brides. After lunch we saw more movies, including not only the “greats” of Egyptian dance, but also some of the absolute worst! Needless to say, we were rolling in the aisles, assured we couldn’t look THAT bad! The day ended with Morocco showing us the cane styling of Egyptian dancers. Emphasis was on a down-to-earth, playful and unsophisticated way of handling the cane. No theatrics, just the way it’s supposed to be done. 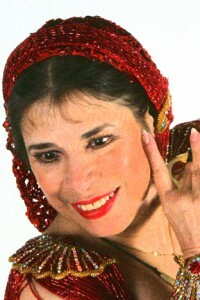 During both daqys, Morocco emphasized the fact that there are very few “experts” in the field of Middle Eastern dance. We should do our research and be true to ourselves as dancers. Seattle simply has to have Morocco back as soon as possible. I have never had so much fun while learning so much. Thanks to Tahia Alibeck and Lincoln Arts for bringing such a wonderful lady to town.